Last week my engine light decided to make an appearance , but, turned out it was something to do with emmissions and something had got coaked up, which has now seems to have cleared. The car was plugged in and the light put out, but since then, there is something different about the throttle response. Brent did say that the ecu would have to relearn. Would the reset affect the map??. This has wiped the map off is this possible? With some ECU remaps the tool takes the old map off and puts a new map on. The old map is then resident within the tool, usually a hand held device like a superchips bluefin (there a quite a few differnet ones around now). With this sort of flash, it is always recommended that the owners swaps back to the standard map when the car goes in for a service incase the dealerships decides to upgrade the ECU firmware due to a bug fix. In theory this may be possible for a Subaru dealer to do, but if the ECU has previously been ECUTEK'd the ECU licence lock will prevent this. Regarding Lucky's, if it was just an ECU reset then the ECU ignition advance multipler (IAM) will drop to 1/2, therefore only allowing initially 1/2 the ignition advance map so you may be a few degree's down on the max ignition advance. This would then increase to use the full map if there is no indication of detonation. This can happen quite quickly, especially of if you force it by doing some 1/2 throttle runs upto around 4,500-5,000rpm. I can get mine to rise to max by the time I get to the top of the road. JGM may of altered the map so that on a reflash/reset the IAM is more then 1/2. Some mappers adjust it some don't. If he did it would be even less noticable after a reset. The MY99 ECU would use an IAM so that it knows how much of the Ignition Advance map to use. Otherwise it would just be applying that map blindly. The ECU that you refer to are all 99/00 units. 2 for 99 and 1 for 00. You can log the IAM with ECU explorer but IIRC it does move around for each ECU. So you have to switch on a number of un-named log parameters. You'll spot it when you see it/toggle the right parameter. I think is starts at 12 and goes to 16. But it's a long time since I played with one. I agree with what Scott said, even though I have no idea what he is talking about!!! Thank you, Scott. If I'm just these days using some files I found of ECU addresses. for just with the ecuexcplorer take values ​​and register them. I am trying to study thoroughly the differences of my PPP MY99 ECU with respect to the AE800 that equips my subaru of factory. I detail the addresses that I found to see if you remember what it would be that I have to see to be able to observe the current value of my IAM if possible .. I have most of the important info and also have data on Prodrive, Ae801 and Ae802. Along with EcuTek2. The Prodrive map runs the most aggressive timing. If you are using external boost controllers to raise boost the Ae802 Is the best ECU to use as it runs richest. I'll fire up my old laptop and see what I can post. Viper1982, I'm not sure what data I have shared with people in the past as it was a long time ago when I last looked at these ECU. However, what you post above looks strangely familiar, even down to the presentation and order of the information. 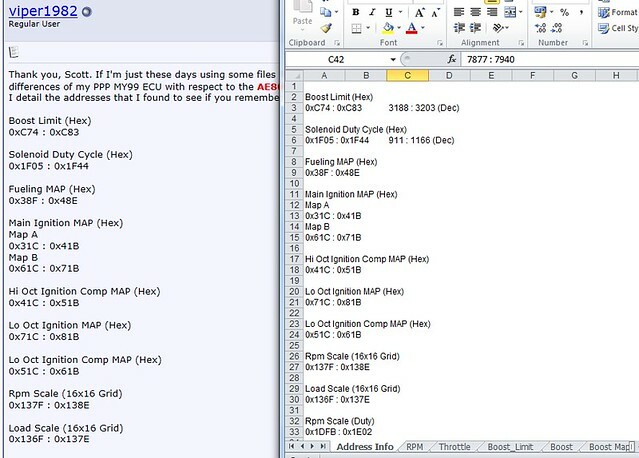 Below is an extract from my own spreadsheet where I address mapped a number of known ECU hexadecimal parameters against the raw ECU image. It may of been a long time ago but I do remember doing it and the many hours it also took to extract the data from the various ECU. You might like to have a think about or rephrase your statement above where you state "I detail the addresses that I found"
For your info the IAM would be in RAM not in the EEPROM/FLASH ECU Image. Only the initial IAM would be in ECU image, probably '0C', so good luck finding it. hello scott, definitely should be the file I found browsing the web for many weeks which seek information, and investigate, that file does not take it out of this forum, the truth and I do not know where it was downloaded, it must be a shared repost On the other hand, when I referred to I found I did not refer to what I found extracting information by my means is more clear that I am a beginner in the subject and I am looking to learn since I am very interested in there was a misinterpretation when using the translator to I can write in this forum since my mother tongue is Spanish. definitely by the similarity of the order of the values has to be an excel file made by you. Scott I take advantage and I consult you, since I notice that you have a lot of experience in the classic GC8, I am driving a prodrive ECU in my MY99 with an MBC adjusting it to 16 PSI (+- 1PSI). my query is, if I achieved better or worse performance using the OEM system of boost of two ports, the original equivalent to my vehicle. I would like your point of view advantages and disadvantages of it. I understand that if I cancel the solenoid the ECU would be working blindly, therefore I would not take advantage of the BOOST maps which have been designed and thought out. Hence, this new question arises, is the MBC or the OEM Bleed System better? Just learn to upload photos in this forum, I put in the presentation area where I leave my greetings. Hello ... nobody here to guide me with the above?